A new addition to Mosque Road’s line of buzzing eateries, Lazio Steaks and More is a swanky spot that serves up everything from tender steaks to city views from their al fresco seating space. With so many food joints and restaurants, Mosque Road has never let our tummies down. In fact, it’s our go-to neighbourhood for authentic Middle Eastern and Muslim-style cooked food. But we never thought we’d ever sit up in a restaurant’s balcony here and tuck into a Chateaubriand Supreme steak and lamb chops. 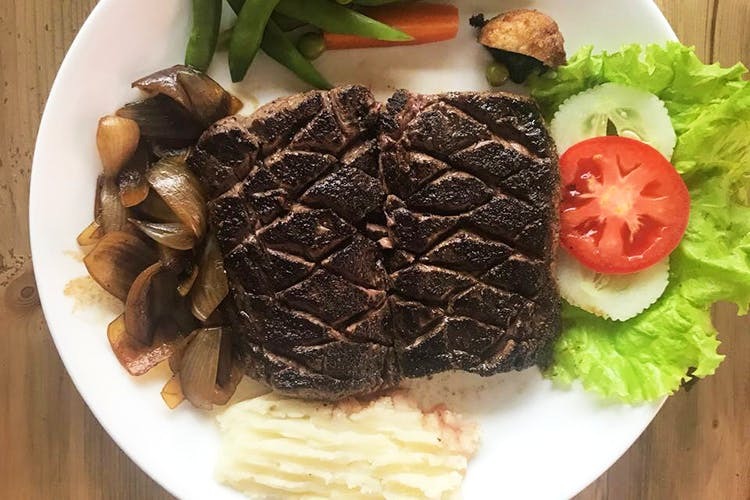 Making it happen is Lazio Steaks and More, a steakhouse set up on the second floor of a nondescript building, right above a supermarket, offering a quaint ambience with classic red and white checkered tablecloths and cycle-themed decor, and an al fresco seating space too. What’s on the menu, you ask? Well, plenty of steaks, of course. We tried the Pepper Steak and the Chateaubriand Supreme which were nice and tender. Served with a side of veggies and mashed potato, their portions are quite generous. The lamb chops are a little tough though. Prices for their steaks started at INR 280. They also had some Continental offerings like pastas, meat pies and sandwiches. Burgers are on the menu too. We tried the Juicy Lucy burger, a loaded number with a chicken or beef patty, a fried egg and fries on the side. Not an ideal for all you vegetarians out there, as there aren’t too many options for you here apart from some Chinese food. Their mains start at INR 150 and you can settle a meal for two at a reasonable INR 700. Their easy old-school eatery vibe has us won over. We’re talking wooden benches, checkered tablecloths and minimalist decor, which make your dining experience feel like a cheerful picnic. They have a subtle cycle theme when it comes to their interiors, with cycle-wheel lamps over their tables, framed photos of vintage cycles on the walls and a spray-painted bicycle that works as a statement decor piece. But our favourite part is their balcony space that lets you pair your meal with views of the bustling Mosque Road. Enjoy the pleasant Bangalore weather as you tuck it into meaty eats, and don’t forget to end on a sweet note by trying their Apple Pie that’s doused in cream.